With the popularity of video climbing steadily, camcorder has become a must-have tool in our daily life. No matter you are on holiday with your family or lover, taking your best friend’s wedding or in a funny party, it is absolutely necessary to preserve those wonderful moments in videos with a camcorder. However, it seems that nothing can be done once for all. You will quickly have a full-of-doubt look when you try to play those camcorder videos on your portable device, such as iPhone, iPad, iPod, etc. Why do I say that? To tell you the truth, videos shot by Sony, Panasonic, Canon and other brands of camcorders are usually in MTS format (a high-definition (HD) video format commonly applied in HD camcorder), which cannot be read by portable media players unless you convert camcorder video to MP4, MOV, AVI etc. See, if you want to play camcorder MTS files on iPhone, iPad, iPod, you need to change MTS to appropriate video format playable on your gadget first. MTS format to MP4 conversion could be your top priority since MP4 not only is widely used on most popular devices but also has a much smaller file size and high video quality. 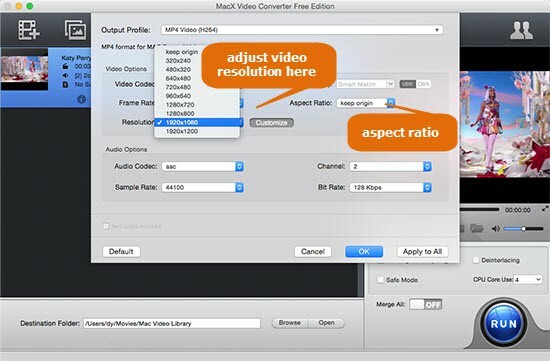 Free Convert MTS to MP4 on Mac Now! Free transcode MTS codec to MP4 on Mac just a click away with the high-end video processing freeware in 5X faster speed (Intel/Nvidia/AMD HW acceleration) & no quality loss. In this case, a MTS to MP4 converter is needed to help you reach this goal supposing that you use a Mac computer. 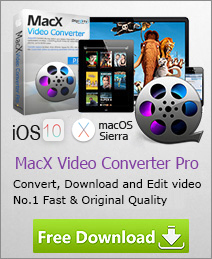 Here, MacX Video Converter Free comes as your solid choice. This freeware has the excellent ability to free convert MTS/TS to MP4, MOV, AVI, YouTube, etc on Mac quickly with high sound and image quality. Thanks to the easy-to-use interface and multi-core CPU, you can finish the video conversion without any hiccup. Step 1: Free download this video freeware on Mac and then run it on your Mac computer. Click "Add File" button to browse your computer hard drive and select files you want to convert. 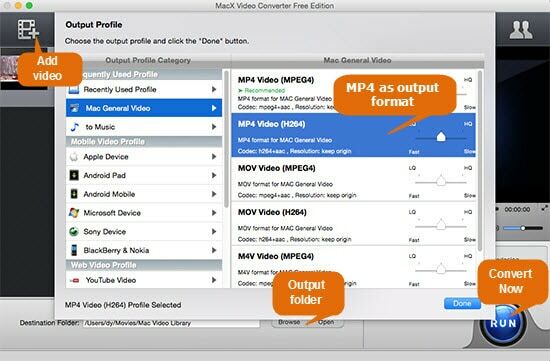 Step 2: If you want to play MTS M2TS files on Mac, iPhone, iPad, iPod, choose "to MP4" as the output format. This camcorder video converter also gives you a hand to convert AVI to MP4, MKV to AVI, FLV to H.264, VOB to MP4, MOV to MP4 on Mac, or directly sync video to iPad, iPhone, iPod, Android, iMovie, iTunes and more as you like, without the necessity of knowing the specific parameters and video formats supported in advance. Tips: To get the optimal video quality, you are enabled to adjust the video codec, audio codec, bit rate, frame rate, aspect ratio, etc according to your own demand. Step 4: Click "RUN" button to begin to convert MTS to MP4 on Mac. You are able to view the MTS to MP4 conversion process or cancel the process at any time. If you want to burn the camcorder video into DVD disc as a gift, you may switch to the advanced version MacX Video Converter Pro, which works as a handy solution to create DVD compatible VOB files to help you burn DVD from HD-camcorder, websites or made by your own with your DVD burning software. Moreover, It also excels in downloading video from YouTube and putting to iPad, iPhone, Samsung, Android, HTC, PSP and other portable devices for offline playback.